The Global Generosity Network (GGN) is a joint initiative between the Lausanne Movement and the World Evangelical Alliance to encourage evangelical Christians to better stewards of their resources, live more generously and give more of their income to Kingdom causes where it is most needed. The GGN challenges the global Church towards whole-life discipleship that includes radical generosity and wise stewardship. The GGN believes that such generosity will result in a dramatic increase in giving to Christian causes and especially to global mission where it is most needed. Encourages better relationships between donors and ministries that receive funding through the use of the Lausanne Standards. 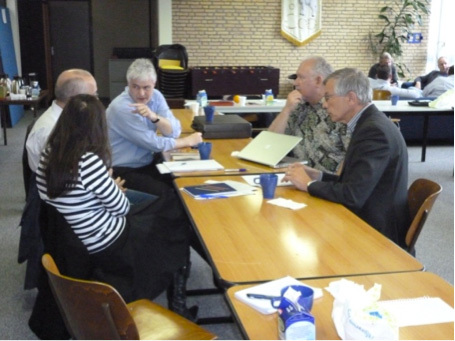 A small group discussion during the Global Generosity Network European generosity consultation in April 2012. Participants came from 8 European countries and included Christian business leaders and representatives of Evangelical Alliances, generosity ministries, church networks, ministry networks and mission networks. 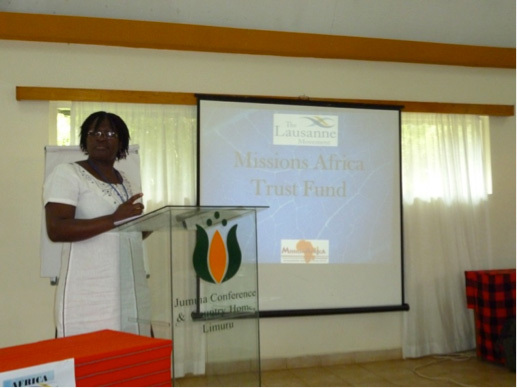 Rosalind Dwarka during a presentation of the Missions Africa Trust Fund, an African mission fund to mobilize resources from Africa to support mission initiatives in Africa and from Africa to the rest of the world. The Global Generosity Network is assisting in developing this exciting African generosity initiative. Contact the Global Generosity Network to discuss assistance in encouraging generosity and giving in your church, ministry, business and area of influence.